Measure the ingredients of your signature dishes with ease using this measuring cup. 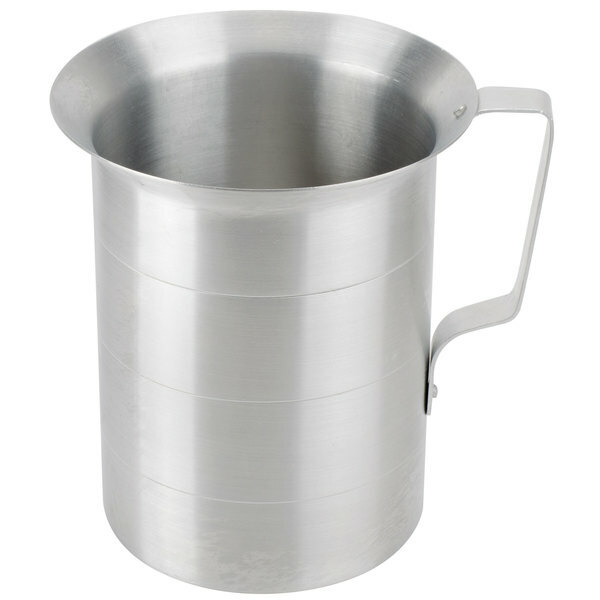 Made of heavy-duty aluminum, this 4 qt. 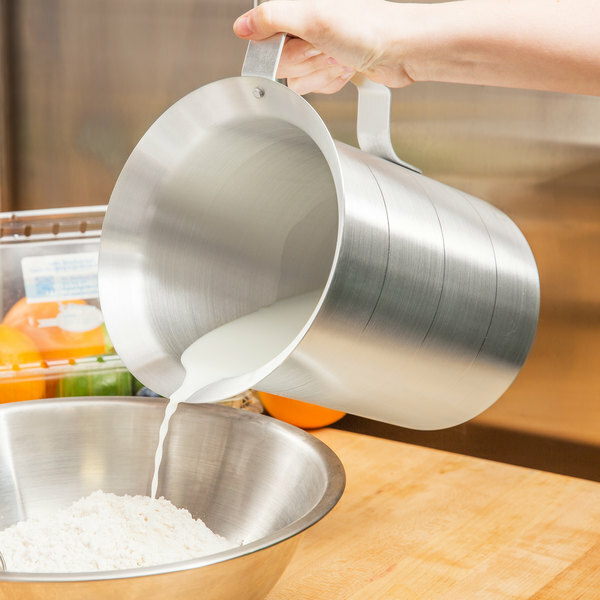 measuring cup is perfect for high-volume kitchens, bakeries or restaurants. Designed for no-spill pouring, this cup's seamless construction, large, riveted handle and capacity markings make make measuring and pouring easy! The is a good, durable, easy to clean, and effective measuring cup that can stand a lot of wear an tear. A price that is a win win for any restauranteer. We have used it for 2 years now and still no dents or anything. Ordered one then later decided that I needed a second. THe price on this pitcher can't be beat. It's very sturdy. Ours gets used daily in the restaurant. This is an awesome product for measuring dry or liquids to make your own sauces. It is unbreakable and sturdy. I would not recommend putting this in a dishwasher because it will change the color or the cup. Highly recommended for commercial use! This is a great 1 gallon measuring cup it gets used a lot in the kitchen when making our different brines and bbq sauces. It measures accurately and feels well made. These are the best measuring cups you can buy. I have also purchased the plastic with the painted and raised numbers but they a.ways wear off. With these, you can use them for measuring and for utility purposes such as dipping soup / stock. We use this for measuring and also for transferring hot liquids. The large capacity and sturdy handle make it exactly what we need. A work-horse. This is a sturdy measure with a well secured handle. We use it only for measuring water but it would be useful to measure any other liquid as well. these are very nice. I ordered three to re fill soup chafers. They are lightweight but still sturdy. I plan to tie a cloth napkin around the handle. These are great. I crack all my eggs into this cup ahead of time and refrigerate (they take up minimum space( so they are nice and cold when I start mixing my brioche. This thing is very light weight, durable and easily to clean. The staff love this measuring cup. I bought one but will order another one soon. We use this to measure the water for our coffee maker in the morning. I am slightly concerned that it may cut someone, as it is sharp...but I had one of these prior that was used for the same thing and we were all fine. Just have to be careful. Overall, this measuring cup is nice and sturdy and can hold enough water to brew an entire pot's worth in the morning. Lightweight and easy to clean! This thing is light weight, durable and easily cleanable. I bought two but will not need the other one till the first gets destroyed somehow. Super strong and sturdy measuring cups. Love the marked sides for easy measuring. These can hold a lot of product and makes measuring large quantities a lot faster. We use this pitcher every day for the measuring of raw goat milk. It is a perfect size for our use and because it is aluminum it is easy to wash and sanitize. The markings on the side are easy to read from the top or side. This measuring cup works great for measuring wet ingredients or lighter weight dry ingredients. The handle is not very durable and if dropped cup and or handle may dent easily. This gallon measuring cup was the cheaper of the two styles offered on this site, but of great quality. I use this measuring cup at work and have seen it take quite a beating. Even after falling into a running 30 quart mixing bowl, with a paddle attachment, it was only mildly dented on one side. I love it so much that I bought one for home and really like to use it to help measure out water for homebrewing and filling brew kettles. The kitchen staff loves this measuring cup. Much easier to handle than other cups. Easy to read how much product you have in the measuring cup. Holds up better than plastic. 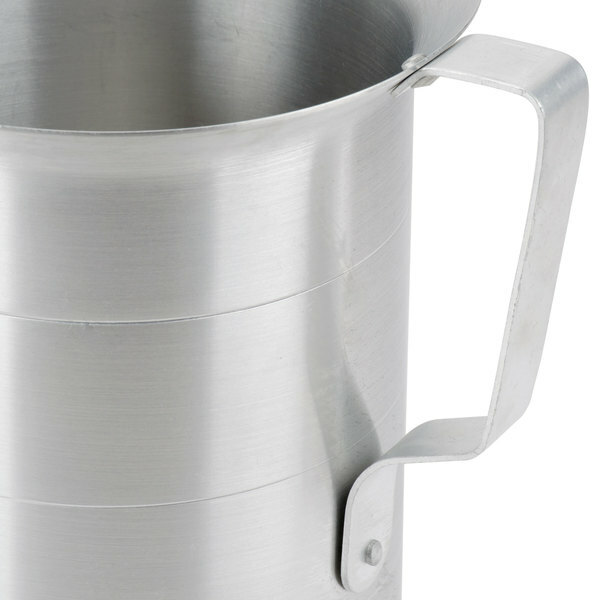 This aluminum measuring cup is sleek and simple. Durable enough to last a lifetime. I always have one on hand, perfect for all liquid measuring needs. This sleek finish along with the ability to properly measure items is a must have in your restaurant! We ordered this measuring cup to replace our plastic cup and are so much happier with it! These are pretty nice to have and are pretty durable. You have to be careful not to use acidic foods or liquids in them though because you will deffinetly get a metallic flavor. This is a must have in the work kitchen and home kitchen. This is very great price for the 4 set of measuring cups. Use hot and cold liquids to measure. Excellent measuring cups! Great for keeping ice cold water ice cold!! Great value, can not be the price!! Works well as a scooper too! Easy to clean and maintain! 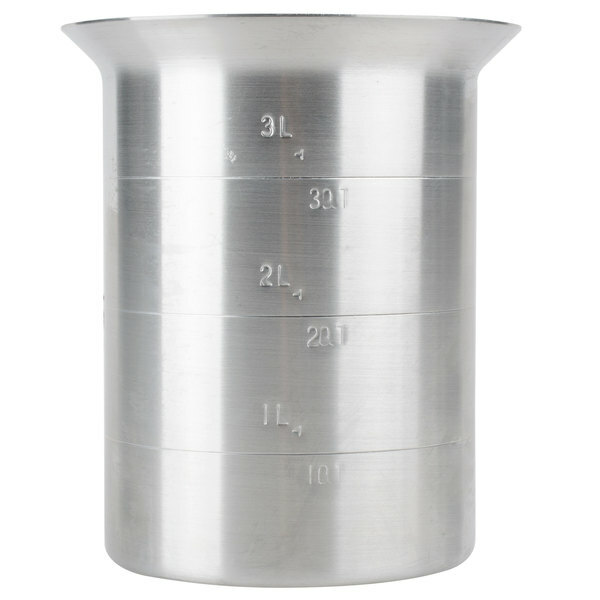 This aluminum type of measuring cup will out last any plastic measuring cup. I believe it will last the entire life of my restaurant and the price is very reasonable for the quality.